NCr series IP cameras are up to 3MP@30fps 2MP/1080P with Smart-IR which can capture clear image without over exposure. NViS 3542P4/P8 equip with 3rd Generation Intel® Core™ i7 CPU with 2x 2.5" SATA HDDs. 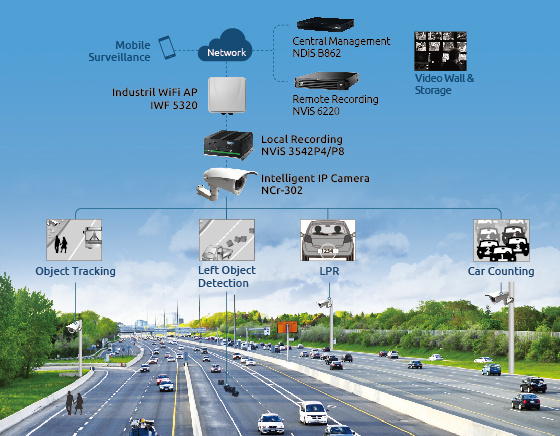 NEXCOM offer the ready-to-go system for adding License Plate Recognition algorithms. Tracking the moving object which is not supposed to be appeared in the area and trigger the alarm. Detecting the static object which is not supposed to be appeared in the area and trigger the alarm. Counting the numbers of vehicle which passing by the entrance & the exit of the parking lot.